Micro fishing rods may be the one subject about which there is the most disagreement among micro fishers. There doesn't seem to be much disagreement on hooks, and not all that much on baits - and lines don't even get mentioned much, but there is quite a gulf on the rods. At first glance, the biggest difference of opinion on the rods might appear to be the length. After all, the tanago rods I have had in stock that are 3' to 5' long and the rods suggested on microfishing.com are 10' and 14' long. Bluegill caught on Daiwa Tanago Rod. I agree that a short tanago rod is a specialty item, and really is for fishing pretty much directly under the rod tip, in water deep enough that your presence doesn't scare the fish. But you know, the people who have them think they're a real kick to use. One of the most memorable catches on my fishing trip to Maine last year was a very modest redbreast sunfish caught within steps of the cabin door. I used a Daiwa Hinata tanago rod, a snelled tanago hook and two swatted black flies for bait. 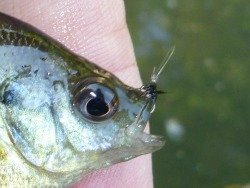 The fish hit the flies as soon as they hit the water, and hit them hard enough to break the snell. I rigged up another hook, this time with an adult caddis that had somehow gotten into the screened porch, and managed to catch the same fish. I removed both hooks and released the fish. At the opposite end of the spectrum, the 14' fiberglass crappie rod is not what I'd call a kick to use. It is heavy and unwieldy and not all that much fun. For me, even more important than the length is the stiffness. I have fished with several different crappie rods. 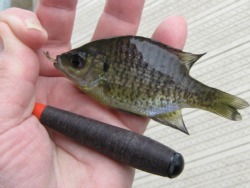 Most are just too stiff to cast unless you have a bobber and split shot that might be appropriate for crappies (or big sunfish) but is overkill for little sunfish and certainly isn't suitable for micros. The only way you can fish for micros with a stiff rod like that is indeed lowering your bait or fly straight down from the rod tip. For the littlest of the micros, any rod will pretty much lift them out of the water just on the hook set. However, with the micro fishing rods I like to use, which are much, much softer than the B'n'M crappie poles, even a pretty small fish can put a bend in the rod and put up a fight. 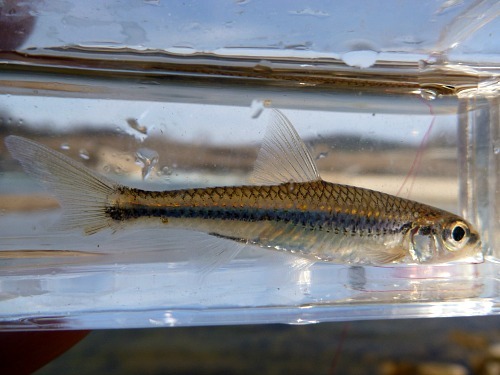 Maybe not a mosquitofish, but small sunfish or chubs or some of the larger minnows and shiners certainly can put a bend in the rod - if you have a soft enough rod. That's what I like. Common Shiner caught on size 26 Utah Killer Bug. If your only goal is to lift a micro from the water it's living in to the water in your photo tank, then it doesn't really matter if your rod is a pool cue. If you agree with me that what happens between the hooking and the unhooking is part of the fun of fishing, then you'll want a rod that is limber enough to actually feel the fish - even the little ones. 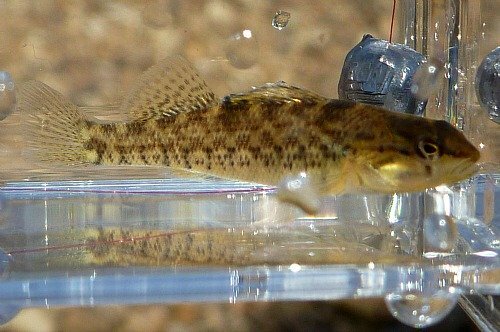 Based on the feedback I've gotten from people who buy tanago hooks and other micro fishing gear, most people do not restrict their micro fishing to true micros (species that when fully grown do not reach a pound in weight). They're catching sunfish or chubs or whatever happens to live in the little, overlooked waterways close to home. A lot of those fish are big enough to put up a fight if the micro fishing rods they use are actually designed to fish for small fish - rather than to lift crappies straight up out of brush piles. And even for people who are life listers, trying to catch as many species as possible, a lot of the fish they want to catch are big enough to put up a fight if the rod isn't too stiff to even feel it. A bigger difference than length or even stiffness, I believe, is how micro fishing rods are used. I think I have cast to micros at least as much as I have just lowered bait straight down from the rod tip, whether the rod was 6' or 13'. If you are after skittish fish for which you need to get bait right under their nose or they won't eat it, then a longer rod does make sense. At some point, though (generally quite a bit closer than 14') the glare on the water will be such that you can no longer see the fish to get precise placement anyway. If you don't have to get bait right under their noses, then casting allows you to cover the same water with a much shorter and lighter rod. Bluegill caught on size 26 Stewart Spider. I'm not talking about spinning rods that would need a heavy weight to cast but light micro fishing rods that can cast a very light line with no added weight, or with just a micro sized split shot. 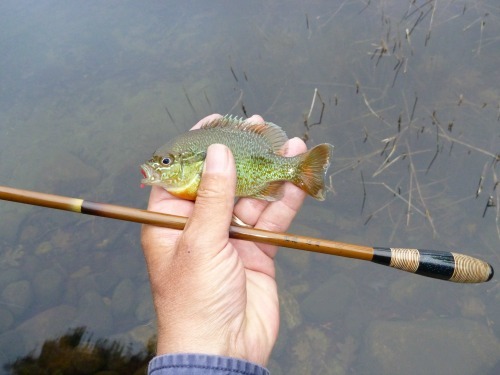 The seiryu rods used in Japan are specifically designed for catching smaller fish - not as small as tanago, to be sure, but a lot smaller than slab crappies! For me, micro fishing isn't just bait fishing and micro fishing rods aren't just bait rods. Perhaps because most of the fishing I did before learning about micros was fly fishing, I'm drawn to fly fishing for micros as much as bait fishing for them. And even when I am bait fishing, much of the time I am casting - just as I would be if I were casting flies. 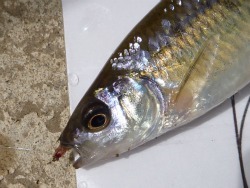 Bigeye Shiner caught on Nissin Air Stage. 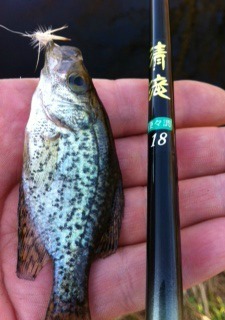 The Shimotsuke Kiyotaki 18 is the most basic micro fishing rod I carry. Its primary attributes are that it is very light and compact (only .6 ounce and 15 1/8" collapsed) so you can easily throw one in a daypack for an afternoon of micro fishing. Plus, it is relatively inexpensive. Also inexpensive, but firm enough that they might be overkill for micros, are the Shimotsuke Tenkara Gen rods. 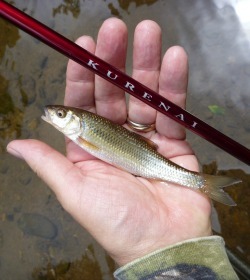 I have them on the site as kids' tenkara rods, but they can double as micro fishing rods. The Nissin Tanago Koro is a very sensitive, premium tanago rod. It is not a rod for 6" brookies, but it is a wonderful rod for 3" shiners. The Nissin Sasuke is quite a bit beefier than the Nissin Gokoro. It is stiffer than you might want for a shiner, but will handle small sunnies or tiny trout with no problem. It will also handle the larger split shot you will want to anchor your bait to the bottom when fishing for darters in riffles. If you can get fairly close to the fish and would like a rod that is substantially nicer than the Kiyotaki and more versatile than one of the tanago rods, the Nissin Air Stage Hakubai are ones to consider. The bigeye shiner above was caught in a good sized stream, but was within casting distance of a 7'10" rod. The Nissin Air Stage Hakubai are ideal micro fishing rods that will double as a rods for little trout in the most overgrown streams. Fallfish caught on Suntech Kurenai. 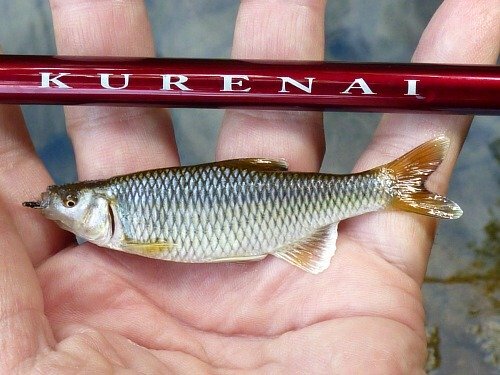 The Suntech Kurenai is an excellent multi-purpose rod that is sensitive enough for micros but capable of handling average sized bluegills and smaller wild trout. The rods in this series are available in lengths of just under 10', just over 11' and almost 13' (but still only .9 to 1.5 ounces in weight). They are wonderfully sensitive rods although they are better suited to casting tiny flies on light lines than fishing with a heavy sinker to hold bait in place in a riffle. They definitely make catching small fish fun and they are also quite reasonable choices for sunfish, modest trout, crappies and even small bass. 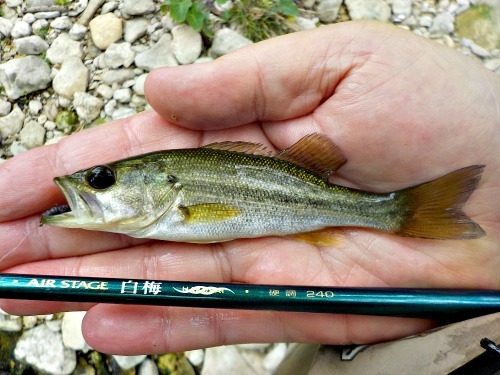 The tanago rods, Nissin Air Stage or Suntech Kurenai rods all make great micro fishing rods. They are all considerably more expensive than the Kiyotaki rods, though, and are in a whole 'nother league than the B'n'M or South Bend crappie poles. That seems to be another major area of contention. I know some people think it is absurd to spend a lot of money on a rod to catch minnows. My response to that is to ask how much enjoyment do you get out of catching minnows and would you enjoy it more with lighter, more sensitive micro fishing rods that would allow you to actually feel the fish on the end of the line? 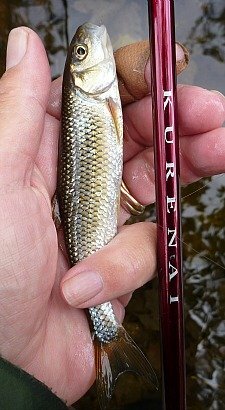 This satinfin shiner put a bend in the Kurenai. Do you need an expensive rod for micro fishing? Absolutely not. Would you notice the difference? Yes, absolutely! Is the difference worth it? That is a question you'll have to answer for yourself. The only guidance I can give is that if all you want out of a rod is to catch a little fish, the answer is no. If fishing, including micro fishing, means more to you than that, the answer might quite possibly be yes.